Party invitations in a simple one expression. 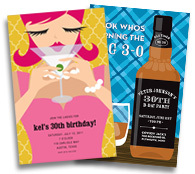 Choose modern party invitations for any occasion with our unique theme invitations, our imprintable party invitations feature foil-embossed border, vellum overlay, die-cut, ribbon embellishments, folder, and premium quality paper card stock. 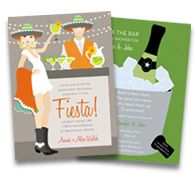 To meet the needs of today's creative bride, we have a full line of blank imprintable wedding stationery cards and papers. 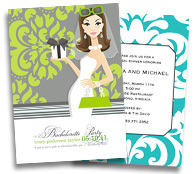 All stationery needed to plan a wedding party, from wedding announcements, wedding invitations, rehearsal dinner invitations, bachelorette party invitations and bridal shower invitations. Honor yourself as mom to be by hosting a baby shower party. 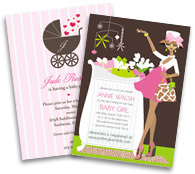 Shop our baby shower invitations featuring baby animals, pastel colors, Christian blessings, stylish moms and more. Announce the arrival of the newest addition to your family and loved ones. 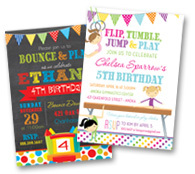 Send either a birth announcement or baby stationery letterhead with baby's hand and foot print, and other adoring specifics. 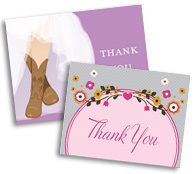 The preprinted designer Thank You cards, and stationery letterhead are offered in variety of themes: baby announcements, baby shower, bridal shower, bachelorette party, wedding party, wedding anniversary, engagement announcements, graduation party, holiday, and birthday party event. Choose from casual, or formal, and from classic, traditional to modern designs. We offer a wide range of business stationery at discount prices to meet your business demands. Stationery items include letterhead, brochures, postcards, business cards, envelopes, and certificates. 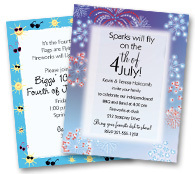 The blank business invitations are easy to print, laser and inkjet printable, and is offered in a variety of designs from moving announcements to retirement party, sports to education, and from conservative to modern contemporary design. 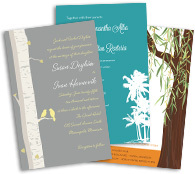 Our business stationery and formal invitations are great for corporate offices, schools and churches. Create your eye-catching brochures, letterhead, business cards and envelopes with our complete stationery sets. Password must be between 8-20 characters long. Must contain at least 1 lowercase letter, 1 uppercase letter, 1 numeric digit but cannot contain whitespace.